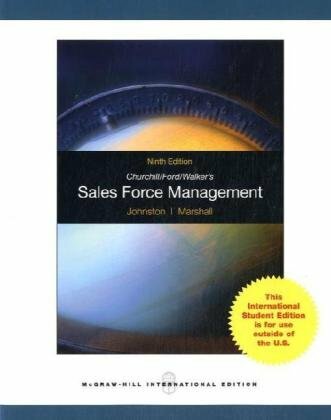 Sales Force Management, 9e remains the most definitive text in the field today. Mark Johnston and Greg Marshall team up to maintain the quality and integrity of earlier editions while also breaking new ground with relevant new content for the changing field. The familiar framework of this text – from which instructors love to teach – remains the same while relevant, real-world student learning tools and up-to-date sales management theory and application have been added. The framework has been developed to portray sales managers’ activities as three interrelated, sequential processes, each of which influences the various determinants of salesperson performance. The three interrelated parts of the framework, formulation of a sales program, implementation of the sales program, and evaluation and control of the sales program, remain consistent and highly relevant in the 9th edition. This edition integrates new, innovative learning tools and the latest in sales management theory and practice. Dr. Johnston is Professor of Marketing at the Roy E. Crummer Graduate School of Business, Rollins College in Winter Park, Florida. He earned his Ph.D. in Marketing in 1986 from Texas A&M University. Prior to receiving his doctorate he worked in industry as a sales representative for a leading distributor of photographic equipment. His research has resulted in published articles in a number of professional journals such as Journal of Marketing Research, Journal of Applied Psychology, and Journal of Personal Selling and Sales Management and many others. He is also co-author of Sales Force Management 6E (Churchill, Ford, Walker, Johnston, Tanner) published by Irwin McGraw-Hill. He has been retained as a marketing consultant for firms in the personal health care, chemical, transportation, service, and telecommunications industries. A partial list of organizations that Dr. Johnston has conducted market research for in the past includes AT&T, American Airlines, Walt Disney World, and the American Red Cross. In addition, he has consulted on a wide range of issues involving strategic decision-making, quality assessment, market analysis, sales training, and international market decisions. Finally, he has conducted a number of seminars around the world on a variety of topics including motivation, managing turnover in the organization, sales training issues, ethical issues in marketing, and improving overall sales performance.